With all of the temptation out there when it comes to Christmas decorating, we wish we had the willpower to resist, and just stick to white. It's simply magical. White frosting, mythical creatures, glittering silver, and visions of Narnia. A fairytale come true. And we think M&S have just about got it covered. 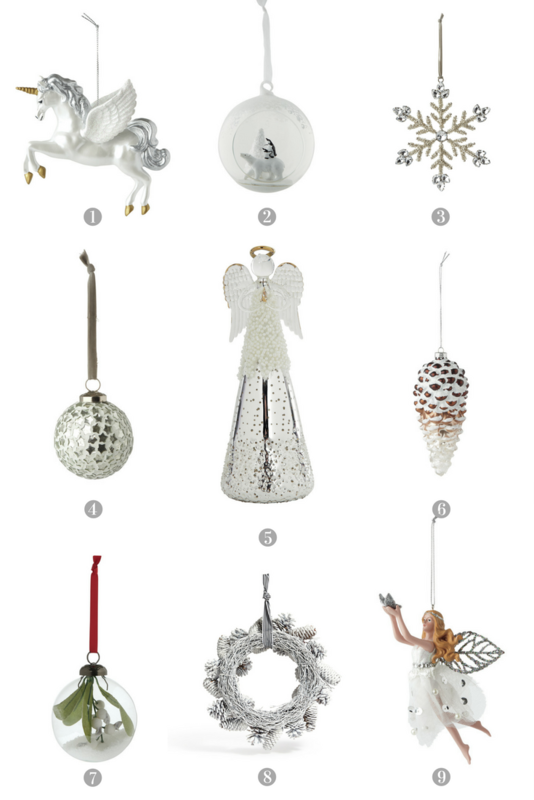 7ft Snowy Potted Tree £200, Silver Star Tree Topper £7.50, Hanging Lit House Cloche £5, Hanging Lit Snowman Cloche £5, Hanging Let It Snow Lit Cloche £5, Silver Beaded Wish Tree Decoration £3, Glass Champagne Bauble £2, White Stag with Silver Glitter £5, Smoked Glass Etched Bauble £6, Pearlescent Glass Droplet £4, Tall Silver Light Up Tree £17.50, Champagne Vintage Style Lights £25, Clara Tea Light £5, Beaded Tea Light £5, Renee Tea Light £5, Renee Large Mercury Hurricane £29.50, Silver Glitter Wreath £19.50, Hartley Tea Light Holder £39.50, Clara Decorative Bowl £19.50, Freya Coffee Table £199, Ceramic Jug £22.50, Luxury Glass Baubles (Set of 20) £19.50, Arch Window Mirror £149, Staveley Medium Sofa in Baril Weave Natural £1,399, Feather Print Oversized Cushion £25, Metallic Print Throw £49.50, Brown Glitter Leaf Bauble £4, Hartley Objet Reindeer £7.50, Mercury Flower Tea Light £3.50, Silver Star Lights £25. 1. Unicorn £6, 2. Polar Bear in Glass Open Bauble £5, 3. Silver Jewel Snowflake £5, 4. Silver Star Mosaic Bauble £5, 5. Tall Beaded Angel £15, 6. Retreat Glass Pinecone £5, 7. Trapped Mistletoe Glass Bauble £4, 8. White Pinecone Wreath £15, 9. Silver Fairy £6.